That’s the statement we started with at the first part of Block 1 – “Who We Are.” Block 1 at our school is always about our identity. We start out getting to know our classmates and other students at Anastasis. For our class, it was learning a lot about what we like to play and how we make friends. Anastasis also holds an Identity Day in the first few weeks of every school year. We want to know more about the people in our school, and we feel more like family after this day! 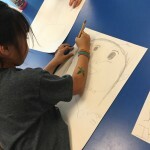 Some of the activities we did during this block included drawing self-portraits and thinking about who we want to be when we grow up. 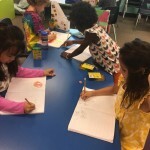 One of our favorite activities was drawing ourselves as stick people and then using our 5 senses to share more about who we are NOW. Some of us drew photos of our our feet playing soccer or dancing. Some drew pizza near a mouth and music near ears. Mrs. Baldwin was really happy to see so many people drawing a heart and writing the words “good friend” right next to it. During this block, we talked about stories we read, and how we see “good guys” and “bad guys”, or HEROES and VILLAINS. We wondered if these stories influence the way we think about ourselves and other people. We thought through stories we already knew and made a list of heroes and villains. 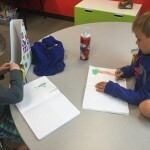 We read some new stories and added to our list. 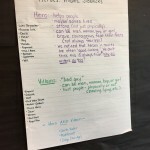 We also made a list of characteristics of heroes and villains, but we noticed that sometimes, heroes might look different than what we expect. A lot of us thought heroes have to big and strong like Superman or have special powers like Elsa. But then we thought about the fable, The Lion and the Mouse. The mouse saves the lion in that fable, and mice are very tiny! We decided that heroes (and villains) can look very different. Their actions are what make them heroes or villains. After a while, we noticed that some characters start as villains and become heroes later in the story (and vice versa). This was a new discovery for some of us… we thought bad guys are always bad, and good guys are always good. Now we know that people, even in stories, have a little bit of light and a little bit of dark in them. We thought about what that means for us! If we make a bad choice, does that mean we are a villain? Is it possible to ALWAYS be the hero? We like the idea that we can be forgiven for mistakes, and that we can even LEARN from our mistakes. We all decided we would like to be the kind of people who could forgive others for mistakes, too. As we move forward into the school year, we want to keep thinking about who we are and how our character is influenced by our friends, our families, the stories we read, and our actions.